I have two albums on this list of favorites that represent the only music I own by the given artist. 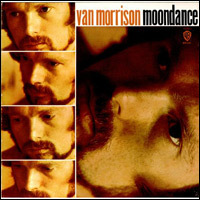 The first is Van Morrison’s Moondance. Can you guess the other one? I’m not sure when I first discovered this album. I don’t recall it playing a major role in my childhood so it could well be that I didn’t hear it in its entirety until high school or college. I knew the title song prior to that, I’m sure, and I was familiar with ‘Brown Eyed Girl’ (which doesn’t appear on this album) but if I had to guess I’d say I picked it up during my late teens when I was on a quest to hear the classics.